Indie Retro News: CPC vs Virgill - A new Music Disk for your Amstrad CPC! 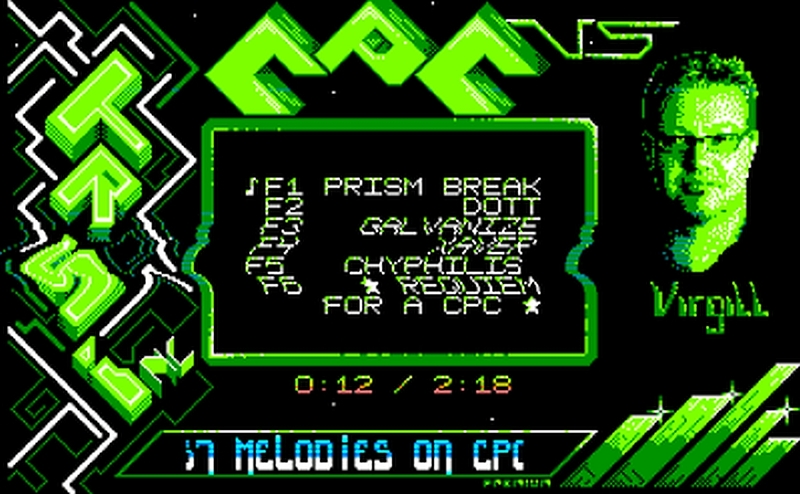 CPC vs Virgill - A new Music Disk for your Amstrad CPC! Some rather epic tunes this evening for your Amstrad CPC, is the latest release by TRSI, 'CPC vs Virgill '. Released at the Nordlicht party last week and coming first under wild demo, is a 6 track musical album of top quality tunes that sound fantastic on both a real Amstrad and via an emulator. Tunes such as Prism Break, Dott, Galavanize, Chyphilis and Requiem for a CPC! Oh and if you haven't heard of Virgill, he's a music artist, texter and graphics artist, going way back to 1990, also previous member of Scoopex!